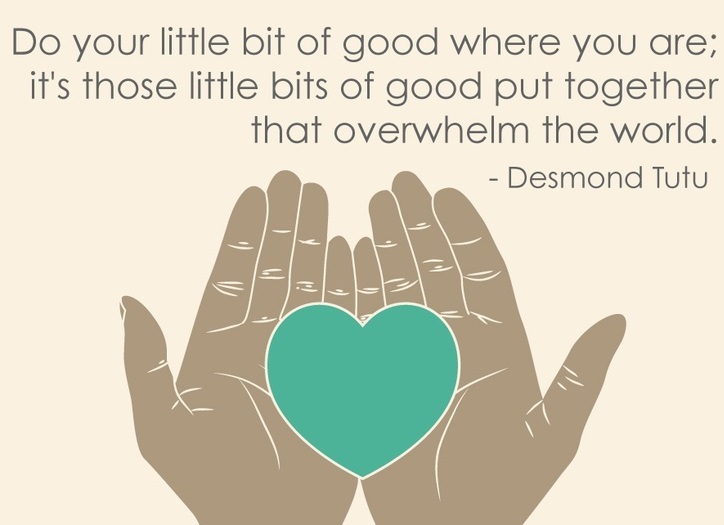 ..when i found this quote by Desmond Tutu it was perfect to sum up how everyone associated with Quilts for Comfort N.E is feeling right now..
Our launch day last week was a big success, we heated the water, filled the coffee pots, laid out the cakes , cut our golden ribbon and opened the doors…. ..we were able to give out lots and lots of QFC flyers (designed by Sarah ) explaining our aims,challenge and all about our volunteer days. If you would like to read more about the background of QFC and how the stitches began go here. A big thank you to everyone who helped and supported us on the day and also for the wonderful donations of quilts, tops, blocks , fabric and funds. We really can’t give comfort with out you all. 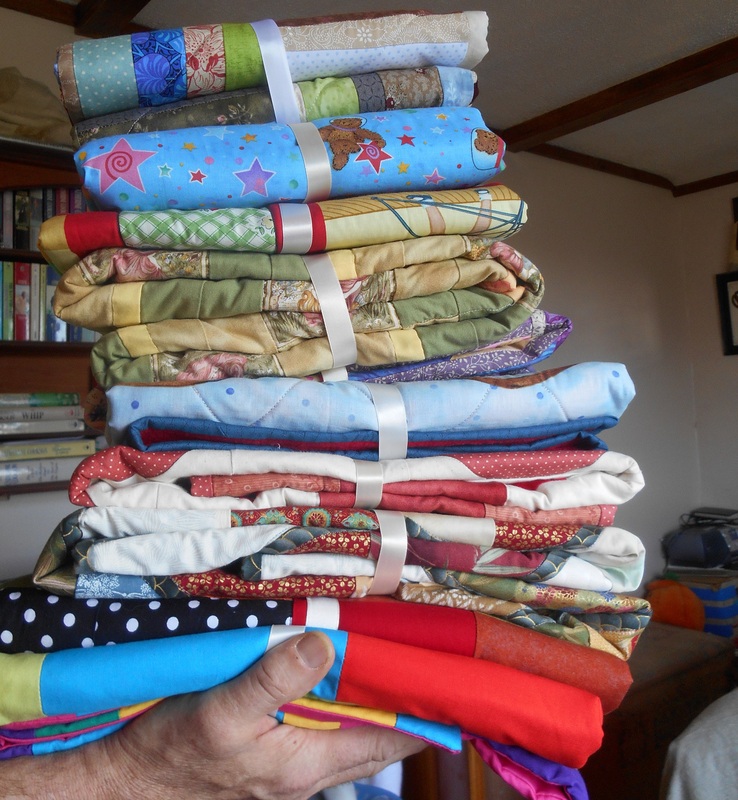 because of all your hard work..another ‘tower of quilts’ is now packaged and ready to be delivered…..
Hiya everybody. I hope you’re all enjoying the summer. It’s a long time since I posted here so I thought I’d give it a go. I’ve spent quite a lot of time longarm quilting and teaching lately but there’s a side of me that you don’t see. 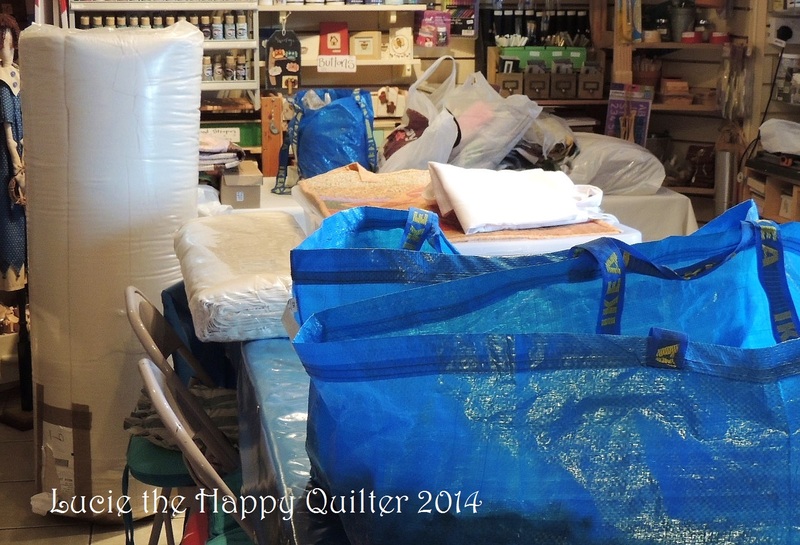 And that side is the part of me that’s working behind the scenes with Quilts for Comfort. Alongside Sandra and Nicola and our Quilts for Comfort family I’m beavering away trying to make a difference one stitch at a time. As most of you know we will soon be holding a launch day just to let everyone know what it’s all about and what’s been happening. So why don’t you come along and see us on Thursday July 10th at The Crafts House. Pop in and have a coffee and one of Nicola’s delicious cakes. Nicola really is the best baker in town and not only that but we’re going to teach her to make patchwork blocks soon. 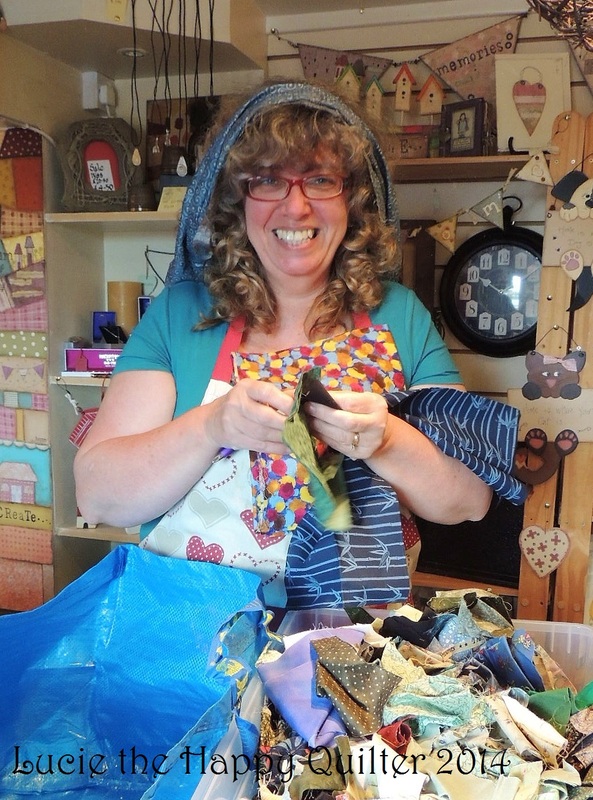 Even if you don’t sew you can play a part in bringing comfort to someone who needs it. This morning we got together to get things ready for the near future. We made lists regarding future plans …..
And put things in some kind of order ….. 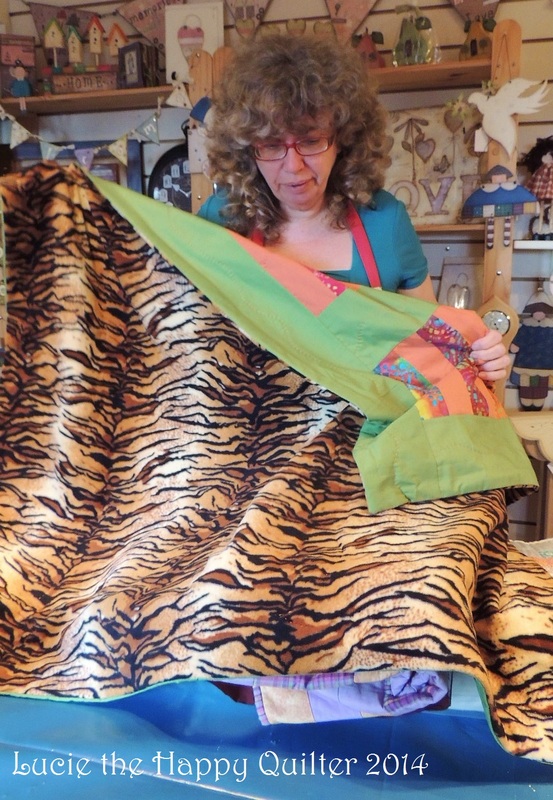 The lovely Sandra played with fabric scraps …..
And Nicola put oodles of fabric scraps in order ready to be turned into comforting quilts …..
We had a look at the latest donated quilts …..
We all agreed that we love the soft animal print on the back of this quilt. We receive a wide variety of quilts. And as well as finished quilts we receive quilt tops and blocks. 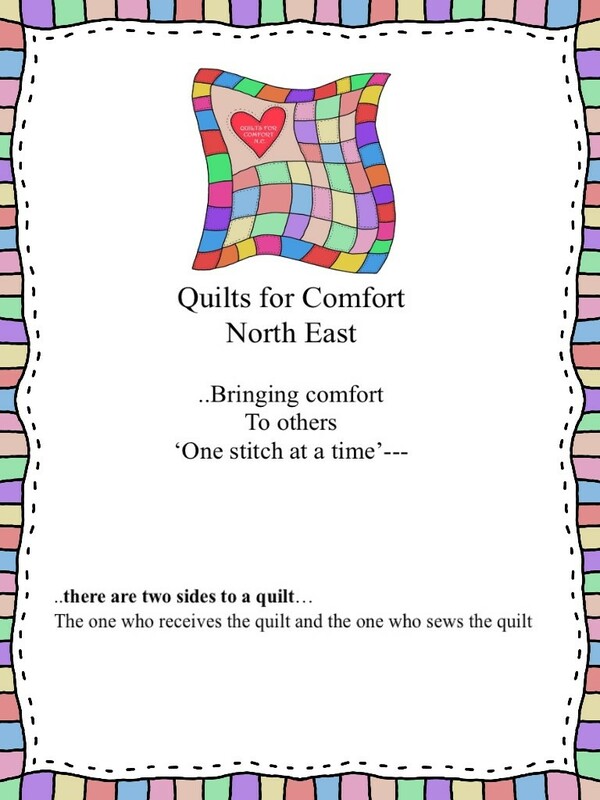 And our very helpful and hardworking Quilts for Comfort family members turn quilt tops and blocks into superb quilts which go to young people needing comfort. It’s not difficult to join the Quilts for Comfort family. I joined last summer when I made a few boys quilts to fill a need and I have longarm quilted a few quilt tops in between everything else I do. And I plan on continuing in this fashion for as long as I can. I also plan on teaching a few newbies how to piece quilt blocks on our Quilts for Comfort volunteer days. So if you don’t sew this might be your chance to learn while doing something worthwhile. As well as our hardworking family we have another great source of support. 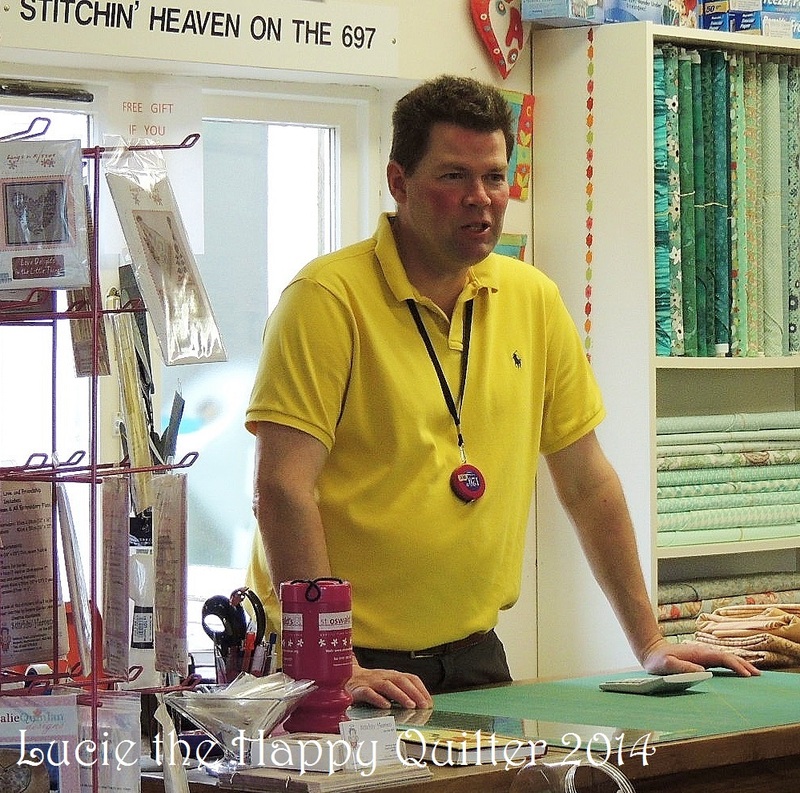 Some of you have already visited Stitchin’ Heaven on the 697 in Longframlington. 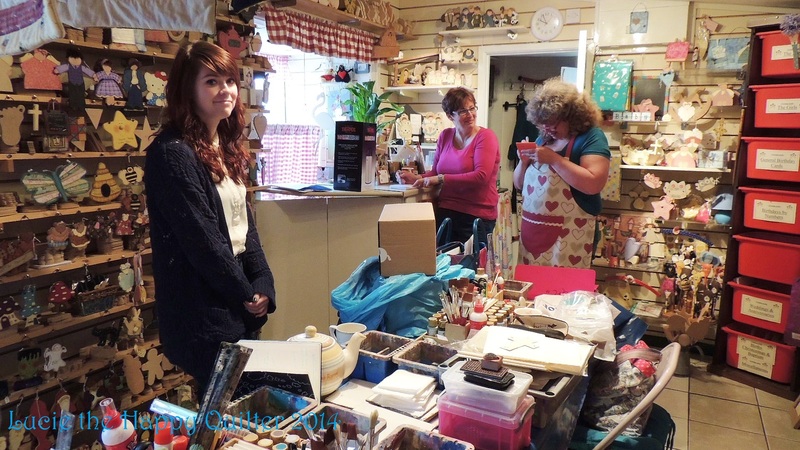 Anne and Mick Davison run the lovely patchwork shop in an idyllic setting in north Northumberland. Anne and Mick have very generously pledged to help us bring comfort to our young friends. I’m so very pleased to welcome them to the Quilts for Comfort family. We can use all the help we can get. This is Anne hiding behind a whole load of quilts kits. This is Mick taking care of business. So I’m looking forward to the launch on Thursday. I’ll be the one sporting a big smile. I hope to see you there. 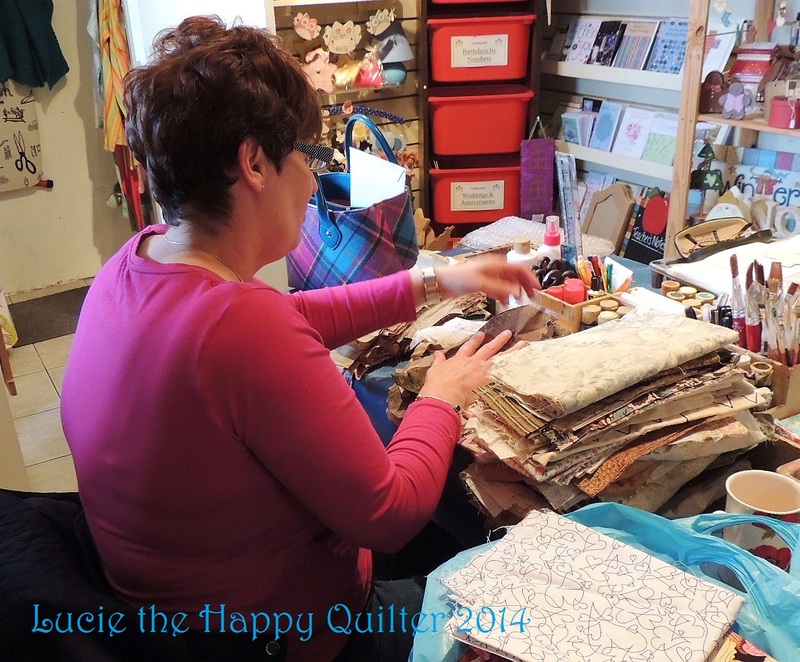 Categories: Quilts for Comfort | Tags: Lucie the Happy Quilter, quilts for comfort, Quilts for Comfort Launch, Stitchin' Heaven on the 697 | Permalink.